Should Your Future be Green? We have combined cutting edge science with smart products and processes to deliver safer, tougher and efficient solutions to our customers. We focus on saving our customers money – putting more green in your pocket! So ask yourself: Should we go green? Absolutely! Let us show you our way! It is so important to us that our customers experience maximum savings. Let us help you achieve these same results! 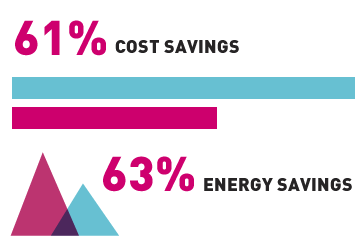 On average EnergyWise customers save 63% on lighting energy consumption! On average SmartClean customers save 61% on product cost! "The Eglé team has truly raised the bar on level of service to new heights. Their attention to detail of our needs with their safer, more effective products is pretty remarkable. " "The Project went extremely well, on time, and within our budget"
"Their products perform incredibly well while helping us to lower our operational costs." "Eglé's approach to energy efficiency is thorough, practical, and impressive. We hope to work with them on many more projects in the future." "What impresses me about Eglé is their attention to detail and tireless effort to get the job done right. From their heavy duty degreasers to lighting initiatives, the Bollinger team has been extremely pleased with their work!" "In these times of austerity, the sheriffs office is always looking for ways to save money and improve efficiency. Add the environmentally friendly features that Eglé cleaning products posses to our approximately 80% savings and its a real winner for us"
"I have been using Eglé's 'Green Products' for the past two years and have been pleased since day one"
"Eglé...provided extensive staff training, and demonstrated value in its safer products while saving us money. We have been very impressed!"